Cow sharks are part of the ancient Hexanchiform order of shark. The four living species of cow shark differ from other shark species in that they all have either six or seven gill slits, unlike the five present in other sharks. 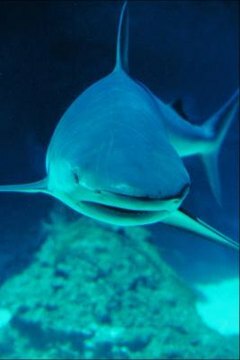 Other sharks also have a translucent third eyelid, called a nictitating membrane, that covers their eyes to protect it from ocean debris. This adaptation is not present in cow sharks. Bluntnose sixgill sharks live in the deepest water of all cow shark species, retreating to depths below 8,000 feet during the day. They swim closer to the surface at night, where they feed on a wide range of marine species, including fish, marine mammals and other sharks. They have the largest range of cow sharks and can be found in all the world’s oceans, as far north as Iceland and as far south as New Zealand and South Africa. Although adult bluntnoses prefer deep water far offshore, juveniles can be found closer to shore. Adult bluntnose sixgill sharks also are the longest of the cow sharks, growing up to 26 feet long. These sixgills are occasionally mistaken for bluntnose sixgills, but they are a different species and don’t range as far north or south as the bluntnoses. Bigeyed sixgills spend most of their time near the ocean floor, in water between 300 and 2,000 feet. Like bluntnose sixgills, they may swim closer to the surface to feed at night, following the vertical migration of the bony fish and crustaceans they eat. Much smaller than bluntnoses, they can grow to lengths of six feet. Patchy populations are found in all the world’s oceans. The largest of the two sevengill species of cow sharks, the bluntnose sevengill grows up to 10 feet in length. Unlike other cow sharks, they prefer rocky bottomed habitats in the shallow waters closer to shore. While they are more commonly found in depths of around 200 feet, they can be seen swimming in water less than 3 feet deep. There are no bluntnose sevengills in the north Atlantic Ocean or the Mediterranean Sea, but they do live in subtropical waters of the Atlantic and Pacific Oceans. Larger individual adults may have deeper offshore ranges. Sharpnose sevengills are the smallest of all the cow sharks and only reach lengths of about three feet. Their narrow heads and mouths distinguish them from the bluntnose sevengill species. They swim along the ocean floor near the coasts of South America, Africa, Australia and New Zealand, in the shallowest water up to depths of 3,000 feet. Although their range is one of the broadest of the cow sharks and they are found in all the world’s oceans except in the northeast of the Pacific, they are fairly uncommon.